TAPFIN, a leading managed service provider (MSP) dedicated to the innovation and delivery of integrated workforce management solutions worldwide, invites you to attend a complimentary webinar that will provide in-depth insight into global employment conditions. Part of ManpowerGroup™ Solutions, the outsourced services offering from ManpowerGroup, TAPFIN offers a complete suite of workforce management solutions that fully leverages a blend of global expertise and local knowledge. 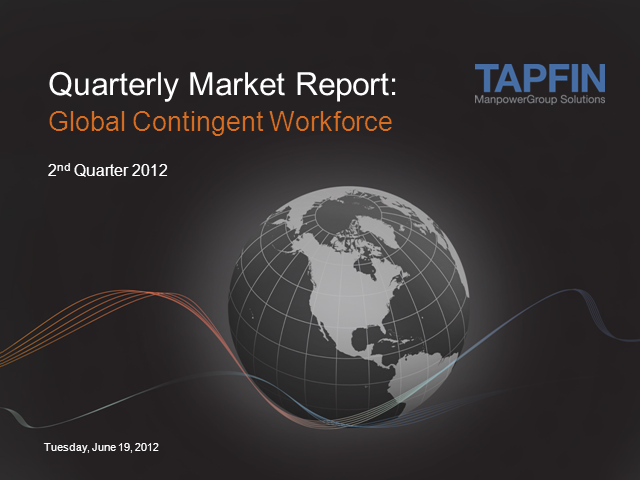 This is shared in part through ManpowerGroup Solutions' Quarterly Market Report (QMR). Whether you are investing in a global initiative, or just looking to gain further understanding surrounding global trends, the QMR results shared in this webinar will give insight into emerging trends and new opportunities for your consideration. The report provides directional insight into emerging challenges and opportunities in each region, and captures regional and country strengths and opportunities to assess implications of the availability, capability, and cost of the workforce, along with regulatory dynamics and market conditions. The webinar will also detail global employment conditions by country and includes information on labor regulations, supplier capability, technology, and environmental conditions. Experis Finance is pleased to continue our Hot Topics webinar series in 2019. Our goal is to provide you with a series of webinars that provide practical insights on topics of interest to internal audit, information security, and compliance professionals. Our upcoming session covers Balancing the Risks of Today with an Eye on the Risks for Tomorrow. For the internal audit function to add value when assessing and evaluating risks it is important to look at the risks that matter most today with an eye on the risks that will matter tomorrow. All functions are expected to provide assurance relative to compliance, cyber and financial reporting risks. A forward-thinking department needs to have a deeper understanding of organizational strategy, technology trends, and disruptive business trends that will impact risk in the future. Corporate audit has the data and knowledge of the business to evaluate organization maturity and agility to take on new initiatives and the related risks. Experis Finance is pleased to announce the third webinar in our Hot Topics series. Our goal is to provide you with a series of webinars that provide practical insights on topics of interest to internal audit, risk and compliance professionals, audit committees, and board members. Our third session covers Internal Audit Function Effectiveness. In this webinar, a panel of seasoned Internal Audit practitioners from Experis Finance will share their insights, experiences and recommendations on how Internal Audit functions can assess the effectiveness of their activities. With different drivers and many available possibilities, this is a classic “one size does not fit all” scenario. This session will help Internal Audit leaders understand the available options in order to determine the approach and methodology that best suits their individual situation and relevant stakeholders. •How is Internal Audit effectiveness defined and how can Internal Audit manage the competing expectations of their stakeholders (Senior Management, the Board, the Audit Committee, Regulators, External Auditors, etc.)? •What are the elements of the Quality Assurance and Improvement Program (QAIP) as defined by the IIA’s International Standards for the Professional Practice of Internal Auditing? Are there different options and possibilities for assessing Internal Audit effectiveness? Whether or not you have embraced a formal cyber risk management program, this session will provide practical advice on the evolving nature of cyber risk management, how to develop and incorporate an assessment process into your organization’s overall risk management efforts, and how cyber risk management can improve your organization’s ability to withstand a cyber-attack. Experis Finance is pleased to announce the first of our Hot Topics Series for Chief Audit Executives and their teams. Our goal is to provide you with a series of webinars that provide practical insights on topics of interest to internal audit professionals. Our first session will cover Agility and preparing for Robotic Process Automation. Issued by the FASB in 2016, the implementation dates for CECL (Current Expected Credit Loss) are approaching and it is essential that appropriate planning and implementation tasks start soon so that banks can be assured of meeting key milestones, most notable the objective of running parallel calculations for the year preceding the go live date. Proper CECL planning is a multi-discipline effort, requiring the time and effort of many of each bank’s accounting, risk and IT groups. Mike Gerdes, Director, Information Security Center of Expertise, Experis US, Inc. The Internet has brought about dramatic changes in the structure, methods and operational capabilities of businesses, and how they interact with their customers, suppliers and communities. Along with the business benefits of the technological advances has come a demand for better security governance, operational risk and performance information to support business decisions and resource allocations. Unfortunately, many security metrics become shelfware or are routinely ignored because the recipients find little value in the measures, metrics and other report contents they routinely receive. •discuss the importance of performing periodic reviews and updates. The Millennial Generation is one of the five generations in today's workforce and now, also the largest! Learn what motivates this powerful generation as they move into leadership roles and mold the future direction of organizations they work within. Whether you lead Millennials today, have them as teammates or colleagues, or you report to one, this session provides insight into what motivates this powerful generation and the ways they will change our workforce over the coming years. Managing operational resilience in today’s digital environment is extremely challenging, whether your organization is public, private or governmental. In response to the continued growth of cyber-attacks, many organizations have decided it’s time to focus more of their efforts on cyber resiliency. This approach to proactively dealing with the potential outcome of cyber-attacks increases the organization’s awareness of the potential impacts and costs, and enables them to take actions that reduce the overall risk to the organization, minimize the impact of cyber-attacks, and more predictably ensure the continuity of essential services. Whether or not you have embraced a formal cyber resiliency program, this session will provide some practical advice on what cyber resiliency is, how to incorporate it in your organization’s overall business continuity management efforts, and what cyber resiliency can mean to improving your organization’s ability to withstand a cyber attack. During this session, we will discuss how identifying risks and weaknesses in the procurement and contract process can result in reduced costs, recovered savings and corporate governance. You will learn how to identify differences between the contracted commercial teams and what is actually invoiced by vendors using a proven four-phased approach, data mining and other techniques to accentuate manual efforts. You also will discover how to embed controls and recover real dollars through an in-depth review of your procurement process and contracts. Presented by George Albarelli, RAS Director, and Bill Consolie, Practice Leader-Construction Services, both of Experis Finance. Assessment and implementation of the new revenue recognition standard is in full force and moving beyond the assessment phase for many companies. This webinar will provide a high-level summary of the new revenue recognition standard focusing on implementation considerations including tax and internal control documentation and procedures, as well as disclosure requirements and examples of the new significant footnote disclosures. This webinar will go beyond the debits and credits and into specific areas that companies should focus on as they move toward the adoption date. The presenters will share their perspectives gained and other issues noted when advising clients on their assessment and implementations as well as noted within industry guidance. IT leaders are increasingly uncovering the value of soft skills within their workforce. They’re telling us that soft skills—specifically communication and collaboration skills—can be as important as some technical competencies. What is causing increasing demands for soft skills in IT talent? How do IT leaders assess the soft skills of new recruits? Can these skills be developed in existing employees? During this webinar, you’ll hear experts from Experis and Right Management discuss the need for improved soft skills within today’s IT workforce and how IT leaders can ensure their workforce has the skills required to succeed in today’s world of work. * NOTE: This event qualifies for 1 CPE credit. Experis is registered with the National Association of State Boards of Accountancy (NASBA) as a sponsor of continuing professional education on the National Registry of CPE Sponsors. State boards of accountancy have final authority on the acceptance of individual courses for CPE credit. Complaints regarding registered sponsors may be submitted to the National Registry of CPE Sponsors through its website: www.learningmarket.org. Should this course need to be cancelled or rescheduled by Experis, a 24-hour notice will be provided. For more information regarding administrative policies such as complaint and refund, contact Learning & Development at 414-319-3400. Year-end tax activities can be overwhelming and put extra stress on you and your tax team. Corporations are often challenged to clarify what their priorities need to be when planning for year-end tax activities. As 2016 comes to a close, there are a number of important items that should be taken into consideration as part of your planning efforts. This 60-minute webinar will update participants on the latest federal, state and international tax developments. Regulators acknowledge the risks associated with vendor relationships and have demanded that business leaders monitor and take responsibility for the actions of their vendors through various laws and standards such as the Sarbanes-Oxley Act, the Gramm-Leach-Bliley Act, the FCPA, the Health Insurance Portability and Accountability Act, as well as the Payment Card Industry Data Security Standard (PCI DSS) requirements and CFPB guidance. Consequently, vendor management is currently at the forefront of organizational risk management priorities and Internal Audit needs to address vendor management and third party risk in their audit planning and execution. The subject of auditing Corporate Culture is gaining a higher level of visibility among board and audit committee members in response to increased concern among regulators and investors. There is a clear "Expectation Gap" that exists between management, boards and third parties as it relates to management ownership of internal controls. The topic goes well beyond the assessment of entity level controls and the discussion of Tone at the Top associated with review of regulatory compliance, ICFR and COSO 2013. The presenter will share his perspectives gained over a 30 year career on the topic of educating management as to its responsibilities regarding promoting an effective system of internal controls. Why is Business Continuity Management (BCM) relevant to your organization? BCM is most relevant to organizations seeking to mitigate exposure to emerging global risk and trends. Learn the "value added" role of Internal Audit. The Foreign Corrupt Practice Act (FCPA) is here to stay. So, too, is the expanding landscape of anti-corruption regulations, enforcement and media scrutiny around the world. Today, more than ever, companies operating domestically and internationally should understand their corruption risks and have effective programs in place to mitigate those risks. This webinar goes beyond an overview of the FCPA to a practice discussion of what your organization can do to help provide senior leadership, the Board, investors, customers and other stakeholders assurance your company is operating ethically and corruption-free across the globe. Join Experis Finance for a complimentary, virtual panel webinar focused on whether or not your AML models for transaction monitoring perform according to regulatory expectations. Regulatory guidance requires independent validation of models used for risk management purposes, including AML systems. Greater emphasis is being placed on institutions to identify suspicious activity and ensure that the models used are effective. This panel, which includes both community bank and large bank perspectives, will discuss the independent validation of transaction monitoring systems, examples of typical validation findings, and the development of an action plan to address the results of a validation. Join Experis for a complimentary, virtual panel webinar focused on the current information security talent climate and steps organizations can take to better protect themselves. It is no longer a question of whether a security breach will happen, it’s a question of “when” and “how much”. In this engaging webinar, host and moderator Jill Harlamert, Vice President of Experis Project Solutions, will engage panelists in discussion on key topics related to protecting your organization in a talent-scarce market. This event qualifies for 1 CPE credit. No advanced preparation or prerequisites are needed to attend this live session. This event applies to the Management Advisory Services field of study. Experis is registered with the National Association of State Boards of Accountancy (NASBA) as a sponsor of continuing professional education on the National Registry of CPE Sponsors. State boards of accountancy have final authority on the acceptance of individual courses for CPE credit. Complaints regarding registered sponsors may be submitted to the National Registry of CPE Sponsors through its website: www.learningmarket.org. Should this course need to be cancelled or rescheduled by Experis, a 24-hour notice will be provided. For more information regarding administrative policies such as complaint and refund, contact Learning & Development at 414-319-3400. • certain industry-specific considerations that could impact your implementation strategy. Join us for Part 1 of a two part series where we will present a technical overview of the new standard. We will also provide general information and best practices to consider when implementing the new revenue recognition standard. Experis™ is the global leader in professional resourcing and project-based workforce solutions. We accelerate organizations’ growth by intensely attracting, assessing and placing specialized expertise in IT, Finance & Accounting, Engineering and Healthcare to precisely deliver in-demand talent for mission-critical positions, enhancing thecompetitiveness of the organizations and people we serve.